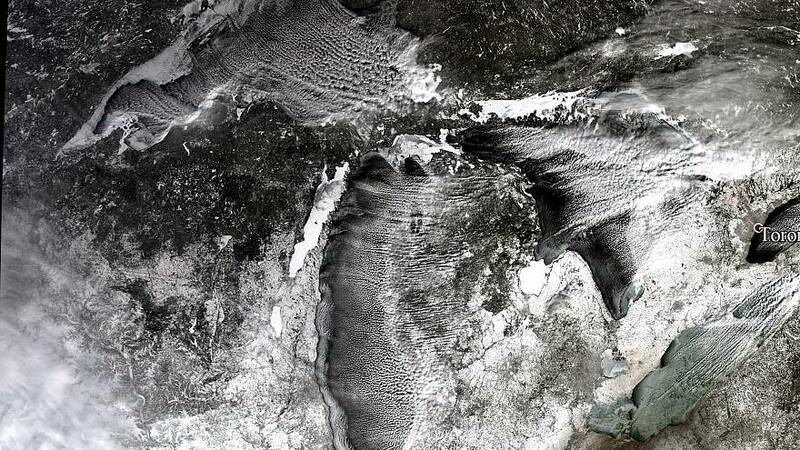 In the US, the deep freeze has continued to shatter records. It has been more than 20 years since temperatures as low as minus 49 degrees Celsius covered swaths of the Midwest and Northeast. More than 20 weather-related deaths have been reported and schools, businesses and government offices remain closed and hospitals busy. However, the icy cold is expected to loosen its grip on Friday with the storm moving farther east. Using EO Browser - Sentinel Hub, we wanted to compare what the Chicago area looked like a month ago to how it looked yesterday. The result is spectacular. Some areas of the Midwest were expected to warm up dramatically by the weekend. Temperatures in Illinois could rise by 80 degrees within days. Experts say the rapid thaw is unprecedented, and it could create problems of its own — bursting pipes, flooding rivers and crumbling roads. The bitter cold has been caused by the mass of air known as the polar vortex drifting south from its usual position over the North Pole. Twitter user Taylor Scallon from Cedar Rapids in Iowa found herself with a brand new hairstyle after braving the freezing temperatures. Temperatures in the Upper Midwest will rebound to well above minus 18 Celsius on Friday. By Saturday, the central Plains will be nearly 20 to 25 degrees above normal, the weather service said. In contrast, Australia has seen its hottest month on record in January, with sweltering conditions expected to persist through April. The heatwave saw temperatures above 40 Celsius for several days straight in some areas.